It's that time of year again! Time to deck the halls, bake cookies and traumatize your children for life by forcing them to sit on the lap of a giant maniacally laughing bearded crazy man. Not surprisingly, Mac was very anti-Santa from the beginning. Like way before we left the house. Actually, any time we mention the big man, he gets this sad look on his face and tells me he doesn't like Santa. I think he's drawing on the photos he's seen of himself crying on Santa's lap from years past (I might have at least one of them proudly displayed in our home because I think it's hilarious). And although this wasn't part of my diabolical plan to get the kids to have dramatic Santa photo meltdowns, I can't say that I'm disappointed in their reactions. Mac's tears started before we even got in the car. They were short-lived and then reappeared when he saw our jolly Santa in all his glory. But he knew that he'd get a treat (a sucker) if he did the photos, so he sucked it up and complied. 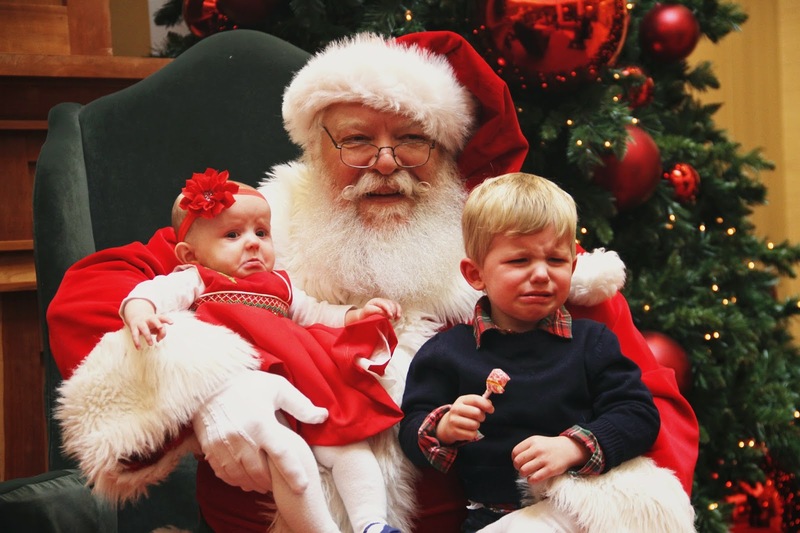 By the time we took the photos, the tears were more because I told him he couldn't open the sucker until he sat on Santa's lap than the actual man himself. Mim, not surprisingly, was actually pretty into Santa - she was kicking and smiling and blowing spit bubbles at him (the infant equivalent to flirting, I think) from the sidelines. She's pretty laid back, so I expected that. But despite her initial excitement, she tends to take emotional cues from her big brother. So, when he lost it, so did she. I think the progression of her expressions in these photos are just the greatest thing ever - from a serious pout to a full out meltdown. Actually, it went just as well as it has the last three years. 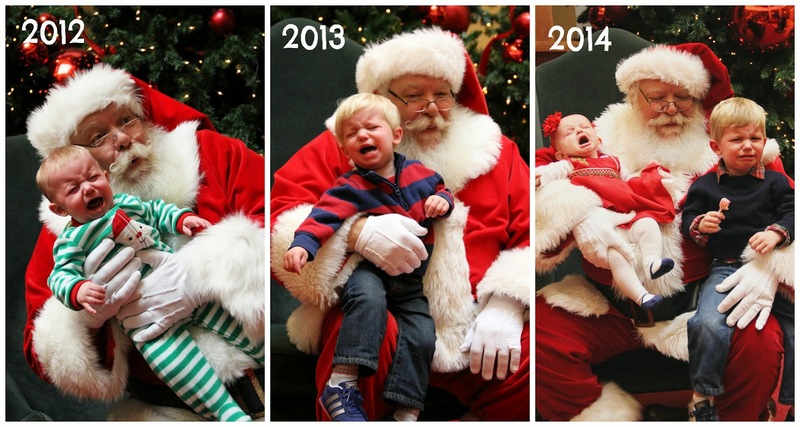 Anyone else a horrible parent and love bad Santa photos? This is fantastic!!! And can I just say, that Santa is perfect!! I wrote the other day about being a Santa snob, he totally fits the bill! Oh my word... Mims lip and Macs snot... I can't handle it!! Crying Santa pictures are my FAVORITE. And these are perfection. I love the look back at the past 3 years!! Way way too cute. This post made me laugh! Hilarious and the photos are pure magic! Hahaha, I am sorry that I'm laughing, but the three pictures are just great. They are totally Ellen worthy! And, Mac's outfit is perfection....BEST looking crier ever!! These make me laugh SO HARD. And OMG Mim's lip!! :( I haven't taken Sadie to see Santa yet... I feel like she'd love him haha. Maybe this weekend! These are so classic! Love her pouty face! And Mac looks the same amount of devastated each year! Fun memories! OMG these are AMAZING. And yes, as you have seen, I am totally a bad parent as well. I traumatized Mason THREE times this year lol. Haha I love them!!! I love how Mim just lost it, like she was thinking to hell with this Santa dude! So cute! Aww...those little sad faces!! Just breaks your heart! This are hysterical!! Mac definitely has the "He smells like beef and cheese" crinkly look about him, hahaha!! We are heading out this weekend to do M's so I suspect we'll have another year of Rocky fist-fighting. Great pics! Mim's little pout is adorable! Cash will be going to see Santa on Friday. Last year, he was hesitant but no tears. I'm anxious to see how this year pans out! haha these are hilarious. You really do have the best ones. Mac literally looks like he is trying to claw his way out of Santa from last year. I actually ended up with a laid back baby (so different than Max) so Max is crying and Colette didn't until she actually got a glimpse of who was holding her. I had been preparing Max to tell santa what he wanted for Christmas in hopes he wouldn't be afraid. btw he only wants shoot guns and bows and arrows. Well a few nights before we went I talked about Santa and Max said "I'm going to cry" I said no, honey you don't need to cry when you see Santa and he said "I think I'll start crying now" and proceeded to get sad and almost cried. So we knew what we were up against... I wonder what next year will bring! Fox 2 shows these types of photos every year on the morning news. You should send them in! I literally laughed out loud as I watched it progress. Lol. This post made my day, what a hoot! They are super adorable though despite the meltdowns!! Love Mac's outfit! Hilarious!!!! Mac's face stays the same but Mim's becomes more and more animated! Love it and love the previous year'a photos too! I've never had a crying babe one - maybe next year! OH poor Mac! At least he did sit on Santa's lap! Calie loves to talk about Santa but wont go near him. And I think Mim mightve made it if big bro wasn't scared :) They're still adorable all dressed up!! I'm DYING!!! Santa fails are my FAVORITE!! So, you can about imagine my disappointment when I discovered my child loves Santa and can't wait his turn in line. WTF kid?! Mim and Mac's matching faces are freaking PRICELESS!!! Mim has the best pout face!!!! Jude did great for about a minute, and then he wasn't having it. So we have a few serious photos and a few crying photos, but I'll take it!!!! I can't help it, but that is hysterical!!!!!! Her expressions are amazing. Bwhahahaha .... I'm sorry, but best ever!! AHh the last collage, amazing! Poor Mac.. and Mim too! Haha, that last comparison is awesome (is that the same Santa? I wonder what he's thinking when he sees you guys show up, lol). Totally hilarious!